This moist chocolate cake recipe is made with milk stout. Beer cake? That's right. Though it might be hard to believe, stout does amazing things in a chocolate cake. So, what inspired me to make a delicious, rich beer cake? During my winter travels, I discovered something revolutionary at the Saugatuck Brewing Company: their Neapolitan Milk Stout. More photos and a link to the recipe are below, along with my recipe tips. Aromas of dark chocolate, vanilla, and strawberry were apparent before I even took a sip - and when I did, it was sweet and smooth with deep, roasted notes . . . way better than any milk stout I can recall before or since. Props to the owners of this microbrewery in Douglas, MI for suggesting I try the brew. It changed how I think about milk stouts! It was so delicious, I was inspired to discover a dessert that would go with it. And...Voilà! 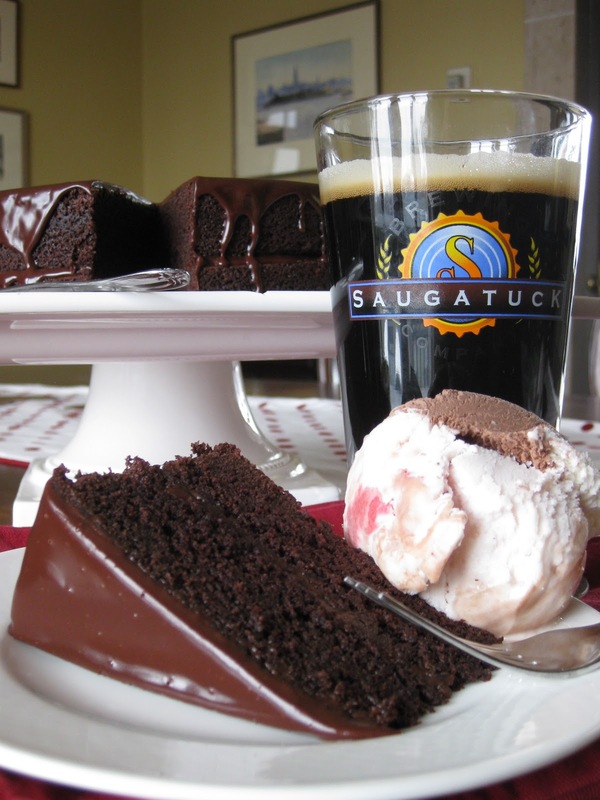 A pint of milk stout, a scoop of Neapolitan ice cream, and a slice of chocolate stout cake. YES, BEER CAKE. Trust me; I promise you it makes amazing and incredibly moist chocolate cake. The actual SBC milk stout isn't pictured...sadly, it couldn't be shipped across state lines. First, though, a little beer background: A stout is dark beer made with malt or barley that has been roasted - a process that can lend flavors of dark chocolate and coffee to the brew. Milk stouts go a step further by incorporating lactose, a sugar normally found in milk. This sugar remains intact in the finished milk stout and lends sweetness and fullness to the beer. The roasted flavors and sweet, creamy quality make milk stout excellent for pairing with chocolate and desserts. 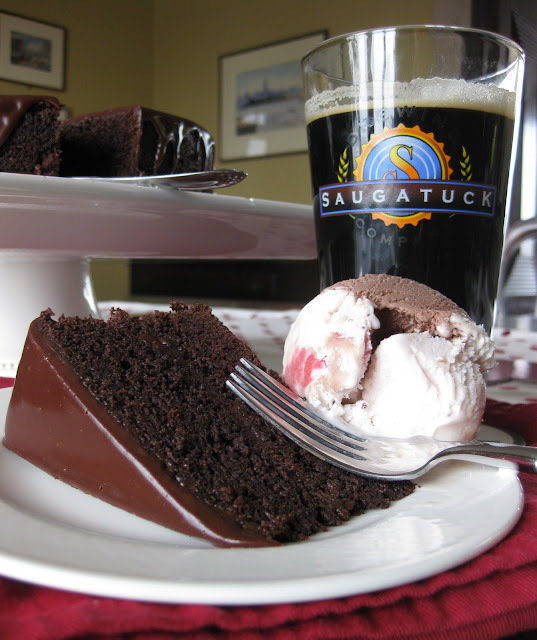 Now, the beer cake recipe: I scoured the internet for a recipe that I could enjoy with the Neapolitan Milk Stout, and then I tested two different Chocolate Stout Cake recipes that both had high reviews. The winner? Epicurious has an unparalleled Chocolate Stout Cake. 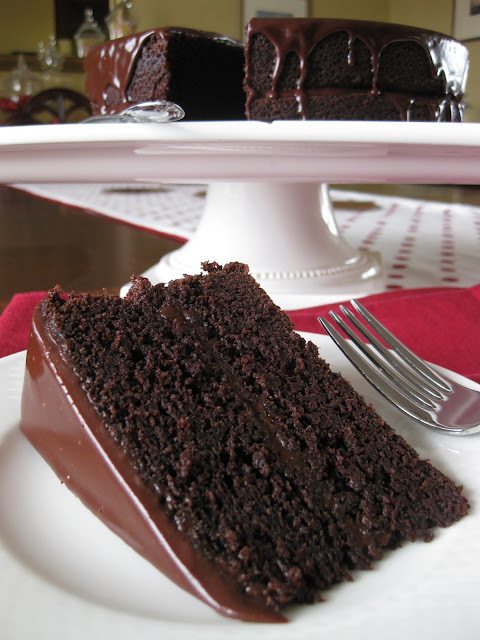 I don't think I've ever had such a rich, moist chocolate cake recipe before. I've made 8 of these in the last month and they always receive rave reviews. This beer cake recipe is the best I've tried. DO use Dutch process cocoa like the recipe calls for. The ale cake will not be the same otherwise. I use Droste brand. Call a few grocery stores or look online. The recipe calls for stout, but I used...wait for it...a milk stout. Dissolve 1.5 teaspoons of instant espresso powder in the cocoa powder-butter-stout mixture. Just a little bit will deepen the chocolate flavor and provide complexity without adding coffee flavor. DO let the butter and stout mixture cool slightly before adding it to the eggs and sour cream. You don't want to cook the eggs when you combine these two. Instead of making a three-layer cake as the recipe suggests, I poured the batter into two cake rounds and a Bundt pan. Make sure to butter and flour the Bundt pan, and use butter and parchment paper rounds for the cake pans. This will help you remove your cake from the pan with ease. After the cakes have fully cooled, carefully level the cake using a large bread knife so the layers will stack more easily. You can also freeze the cooled layers until you need them. This makes them easier to level and handle without breakage. To balance the richness of the cake, I didn't fully frost it. I removed my cooled frosting from the fridge and re-warmed until it was just pourable, and poured it between the layers and on top of the cake. This stout cake recipe makes a superb moist chocolate cake. New favorite brew, new favorite chocolate beer cake recipe!